03/20/2019 03/30/2019 - by Liam Weisman - 2 Comments. If you are a budget conscious guy and a gaming enthusiast, you definitely know how hard it is to find a decent gaming laptop which is also pocket-friendly. Well, it seems someone has eventually remembered you! It is fair to state that Dell has really tried to merge budgeting constraints with decent gaming. At first, we were tempted to dismiss the Dell Inspiron i5577-5335BLK-PUS laptop as just another halfhearted attempt at satisfying passionate gamers looking for affordable, okay gaming machines. But packing a fast, powerful NVIDIA GeForce GTX 1050 Graphics card into this machine was a game changer. Comfortable screen size – 15.6 inches with anti-glare. The Dell Inspiron i5577-5335BLK-PUS is designed to be a solid, if not spectacular gaming laptop. Without breaking the bank, you get very wonderful all-round-features and get to play almost all the trending games. If you are looking for a powerful machine for your office work, graphics, programming or video editing jobs, this would also be an ideal machine. Unless you are looking for luxury, the 7th generation Intel Core i5 processor and upgradeable 8GB RAM makes it an excellent multitasking companion. Throw in all the essential ports and you have yourself some assured reliability typical of Dells. The Dell Inspiron i5577-5335BLK-PUS is a thin-just 23.3mm- typical dell but with a refreshingly sleek new easy-open design. Of course, people have really rated the Alienware line, but this one rocks with it nicely with a dare-feel- me smooth black plastic finish with an eye-catching sprinkling of red over the logo surface and vents. It is clear you are dealing with an exceptional laptop from a distance. If you are looking at adding beauty to your desk, expect some knowing glances with this machine every once in a while. Plus the optional backlit, bottom-mount keyboard makes typing more comfortable. The keyboard comes with a dedicated numbers pad which while common in 15-inch laptops is a useful addition especially if you are a Ms. Excel fan. Trackpad works okay though may not rank among the best typing pads. Still, if you’re planning on getting important typing work done, it should get the job done. Just don’t expect a MacBook Air keyboard here. At approximately 5.7 pounds and 1 inch thin, this laptop may not be the most portable. Anyway, gaming laptops are not always the lightest, so you should not pay much attention to the weight factor. Generally, we would say the design is by far closer to that of premium laptops than your ordinary budget laptop. For gaming laptops, the display is key. There is a rather competent 15.6” FHD LED-Backlight display on Dell Inspiron i5577. Plus it is fitted with an NVIDIA GeForce GTX 1050 dedicated Graphics card powerful enough to play all your favorite games. In our tests, the laptop performed admirably well with games such as Battlefield 4 or GTA 5 at great settings of up to+60 fps. It will also work with high-level games such a WatchDogs 2 at a not too bad+30fps. You will enjoy a 1920×1080 resolution, pretty good for a laptop of this size though it does not support touch. One of its drawbacks is the lack of IPS technology making the display quality to be slightly limited. But the TN technology used is known to have very short response times making it the preferable for gaming. When combined with LED backlighting, you experience excellent brightness while still maintaining battery efficiency. The anti-glare should protect you against the extreme brightness. Contrast and viewing angles are not as spectacular as they would be with IPS, though we think you won’t get a better display at such an incredible price – so it’s probably not a too bad trade-off. The best news is that you can still plug in an external monitor via your HDMI to enjoy that out of this world display experience. The Dell Inspiron i5577-5335BLK-PUS has three USB 3.0 port and lacks a USB type-C port. Not to worry if you need USB 2.0 connectivity since USB 3.0 is backward compatible. The Dell Inspiron i1577-5335 offers wireless connectivity via the Intel 3165 Wireless card. It works with the dual-band 1×1 802.11ac wireless standards. Your wired connectivity needs are catered for through a single RJ-45 Ethernet port. You can connect personal gadgets through the Bluetooth 4.2 while your external audio connections are handled by a single COMBO audio jack. The Dell Inspiron i1577-5335 is powerful hardware. The 7th Generation Intel Core i5 7300HQ processor, has a 2.5 GHz clock speed (6MB Cache), but which can still be turbocharged to 3.5Ghz if you still want it to take more load. The processor is based on the popular Kabylake chip offering quad-core set-up but does not support Hyper-Threading meaning not a very impressive laptop for high-level multitasking. But multitasking can be boosted by the good amount of RAM which we’ll cover in a while. On the CPU benchmark test, it managed 6789 on the Average CPU Mark which is an overall decent mark for a laptop of its price range. Balancing the performance is the DDR4 8GB RAM. Well, gaming enthusiasts prefer something like 16GB, probably that’s why there is an extra RAM module to make it easy for you to upgrade to a maximum rating of 32GB. The amount of RAM one might need for gaming/ordinary computing tasks is an interesting topic we’ve covered in the past. If you get a bit confused about how much RAM is necessary, here’s everything you need to about how much RAM you need. 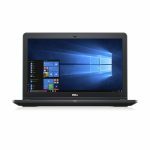 Alternatively, the Dell Inspiron i5577-7342BLK-PUS (16 GB RAM, 512 GB SSD), the Dell Inspiron i5577-7700BLK-PUS (12 GB RAM, 1 TB HDD + 128 GB SSD) or the Dell Inspiron i5577-7359BLK-PUS is recommendable configurations offering just enough oomph to power through multitasking jobs. Check the Configuration list for a detailed breakdown. The NVIDIA GeForce GTX 1050 dedicated Graphics card with a 4GB Video RAM will accommodate most of your games without exceeding expectations. It, however, excels in heavy software such as graphical and video in addition to routine applications such as Netflix. The 256GB SSD has considered acceptable for a laptop this size though more could be better. Nevertheless, applications and operating system launch faster. The optional backlit keyboard makes typing fun again not to overlook a dedicated numbers pad for those who appreciate numbers. Trackpad works ok though may not rank as the most awesome. The Integrated Widescreen HD (720p) Webcam allows you excellent recording and viewing options. The laptop has a 6-cell 74Whr integrated battery. For activities such as web browsing or word processing, you can squeeze 4-5 hours from the battery. Battery life will however significantly fall to approximately 2 hours when in intensive gaming meaning you’ll have to plug in your charger a little too soon. Considering the hardware, the Dell Inspiron i5577 battery life is considered decent. The laptop is fitted with MaxxAudioPro (Windows) and a quality headphone jack. The machine can also support stereo speakers and subwoofer. Overall, we don’t expect to find the best audio speakers on laptops. So don’t expect to be blown away by the Dell Inspiron i5577-5335BLK-PUS audio ability. Headphones/ earphones are a good way to go if you really need to play audio. But we also recommend going for external speakers if you need higher quality audio performance. Dell did not include an optical drive in this laptop so if you often use DVDs, consider purchasing an external DVD. On the other hand, the integrated SM/MMC card reader is very useful if you love memory cards. Dell Inspiron i5577-5335BLK-PUS is a truly competitive gaming laptop at a price of less than $800. Of course, I would go for that premium gaming animal anytime given a chance. But what if I am looking for a comfortable gaming machine and without overstretching my pockets? I would go for Dell Inspiron i5577-5335BLK-PUS anytime. Yes, it has its some key weaknesses such as an average battery life but that’s one common feature with gaming rigs. It comes with some Bloatware but that can be easily dealt with. Bottom line, those looking for a sleek, budget starter gaming laptop, the Dell Inspiron i5577-5335BLK-PUS makes a great case for itself. 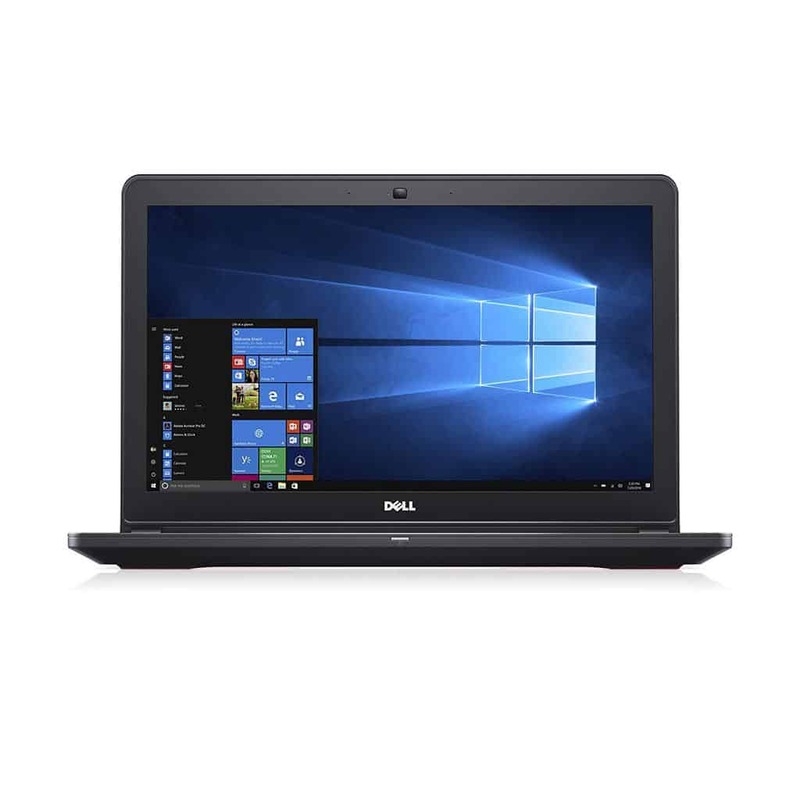 For users looking to try out higher performance options of this laptop, the Dell Inspiron i5578-0050GRY is a higher series that comes with Core i7 processor for the same price. For this series, however, the Dell Inspiron i5577-7700BLK-PUS laptop (12 GB RAM, 1 TB HDD + 128 GB SSD) stands out for having the most comprehensive features, but of course for slightly more.